In the last post, we discussed about How to count the number of chromosomes and chromatids in mitosis ? The concept is same in the case of meiosis also. These are the essential prerequisites for meiosis. 2) Inorder for crossing over in meiosis I of prophase I to occur, 99.7% of DNA replication and 75% of histone synthesis must occur by prophase I.
Meiosis is reduction division that occurs only in germ cells where gametes are produced with half the chromosome number to that of the parent cell.Gametes are always haploid. Gametes should be haploid for maintaining the chromosome number of the species. This is achieved by meiosis, the reduction division in germ cells. The purpose of meiosis is the production of 4 cells with half the number of chromosomes. 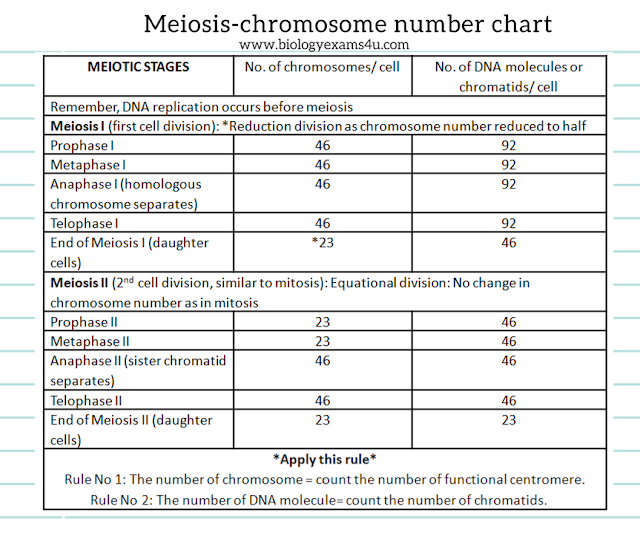 Here at the beginning of meiosis, chromosome number is 46 (diploid). After meiosis, the resulting cells or gametes has 23 chromosomes (haploid).